Where have all the blockbuster drugs gone? Long-time passing? Where have all the patentable synthetically-made blockbuster drugs gone? Gone to patent graveyards everyone. Big Pharma is about to be dismantled as pharmaceutical patents expire, representing $78 billion in sales. Thirteen drugs including Lipitor, the cholesterol-lowering drug, Plavix, the blockbuster blood thinner, and Nexium, the designer acid blocker/heartburn remedy, will become generic drugs by 2015, says an article in Managed Care magazine. Furthermore, new drug approvals aren’t filling the gap created by the patent expirations. The number of newly approved drugs has dwindled to less than a dozen a year and Big Pharma is pressing the FDA to approve new drugs much faster. This downfall couldn’t happen to a nice bunch of guys who have gouged the American public by buying off physicians and politicians. Their drugs haven’t been purchased on a competitive bidding basis by Medicare because Congress is lobbied heavily by Big Pharma. Due to industry pressure, the FDA approves drugs that are ineffective or only marginally useful over older medicines but are posed as modern improvements. Some drugs approved by the FDA are frank “killers.” They sometimes increase the risk for death over and above that of other drugs or an inactive placebo pill. Do you recall Celebrex, that widely TV-advertised drug that was not supposed to cause as many bleeding gastric ulcers as other non-steroidal anti-inflammatory drugs? Of course, this was all a falsehood propagated by a drug maker who rushed Celebrex to market at the expense of patients’ lives and health. But this is the kind of influence drug companies can exert, desperate as they are to raise falling stock prices and replace patent-expired drugs. Do looming patent expirations help the FDA change its mind? An example of Big Pharma’s clout is the recently approved blood-thinning drug ticagrelor (Brilinta), which an FDA panel initially declined in December, 2010 by a 7-to-1 vote. Keep in mind that the patent for the reigning blockbuster anti-clotting drug clopidogrel (Plavix) expires next year. The maker of this ticagrelor (Brilinta) appealed and re-submitted data from European trials to gain FDA approval on July 20, 2011. 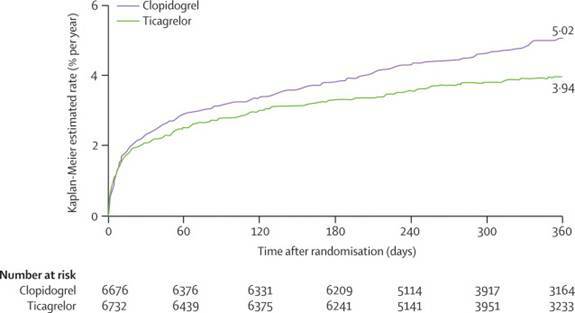 But comparative studies in the US showed that clopidogrel (Plavix) produced fewer deaths (3.2% death rate for clopidogrel versus 3.8% for ticagrelor). Larger studies confirm the lower 3.2% death rate for Plavix. So how did Brilinta suddenly exhibit a 16% lower death rate than Plavix? Simple: the drug manufacturer monitored its own trials in Europe, but not in the US. Do we have another Vioxx in the making here? The FDA relied upon drug manufacturer data for Vioxx, a drug that was later recalled. Examine the chart below. It shows the difference in cardiac events (strokes, heart attacks or death) with clopidogrel (Plavix) versus ticagrelor (Brilinta). While the relative difference between the two drugs is 16%, the actual difference in hard numbers is about one percent (3.94% vs 5.02%). The patent for Plavix is about to expire, which would likely drop its price to under a dollar whereas Brilinta is already priced at about $7.24 a day in the U.S., or 20% more than Plavix. Already some generic companies have jumped the gun to offer generic clopidogrel, but a court order demanded they wait till November of 2011. That’s quite a price difference to pay for a 1% difference in effectiveness. Oh the rhetoric is how to “substantially increase the number and quality of innovative, cost-effective new medicines,” but that isn’t quite the present reality. All along drug companies have been foisting off pills that offer false promises of a cure. For example, statin cholesterol-lowering drugs, more than two decades after their first use, have not been shown to reduce death from coronary artery disease, though they do reduce levels of circulating cholesterol and slightly reduce the risk for non-mortal heart attacks. Mevacor, the first statin drug introduced in 1987 didn’t even reduce cholesterol enough to reduce the risk for non-mortal heart attacks, but the FDA said nothing. Big Pharma was in control. It must be recognized that the Food & Drug Administration is largely an arm of the government that protects profits by America’s drug companies which dominate 60% of pharmaceutical sales worldwide. A clear example of how politicians become minions for drug companies was when South Africa threatened to ignore US drug company patents on anti-AIDs drugs and to begin drug production on their own. Then Vice-president Al Gore flew to South Africa to issue a warning not to violate drug patents or the US would invoke trade sanctions. Doctors fall in line because pharmaceutical companies advertise and send them patients, so they give their clientele what they ask for, even if the drugs aren’t proven safe (remember Vioxx, that led to the premature death of an estimated 2,000 Americans?). And doctors are paid a drug consultation fee by insurance companies and Medicare that is added on to their examination fees every time they prescribe an Rx drug. So there is incentive to prescribe, and prescribe, and prescribe. Some authorities now argue ties between physicians and drug companies should be completely severed. It wouldn’t be too soon. Drug companies have gone to extremes to preserve profits, launching appeals to extend drug patents and to pay off generic drug companies to delay their production of recent off-patent drugs. It has been suggested that drug patents be purchased from pharmaceutical companies and licensed at no charge in the interest of public welfare. Drug profits have been called obscene. The World Health Organization says one-third of the global population lacks regular access to essential medicines largely due to their lack of affordability. Decisions as to who lives and who dies in the world are often made at the expense of enforcing drug patents and prices worldwide. Undeveloped nations simply can’t afford modern medicines. And it’s clear, in developed nations with burgeoning populations of retirees create a burdensome bill for health care, that efforts to make medicines more cost effective are running head on with efforts by the pharmaceutical industry to maintain inordinately high prices. The strange thing about the pharmaceutical industry is that it has gravitated to offering Americans the most expensive rather than the most safe and effective medicines. What is good for Big Pharma will have to be good enough for America. Big Pharma is obviously not in the business of making drugs more cost effective, it is in the business of running up the bill and paying off Congress to mandate payment via pools of money in insurance plans. While the pharmaceutical industry bemoans the fact it is losing profits because millions of patients aren’t compliant in taking the pills as prescribed, Big Pharma never quite poses this problem the way it should be said, that many of these “FDA-approved” drugs cause troublesome side effects and are simply unaffordable. Cholesterol-lowering statin drugs appear to be safe only because so many people for whom they have been prescribed had to abandon them due to side effects. Patients who don’t take pills can’t be counted in side effect data. What will Big Pharma do now? Who are they kidding? Big Pharma has run out of man-made molecules. This is just empty rhetoric to keep the R&D departments churning in America’s pharmaceutical companies. The pharmaceutical industry has only been able to demonstrate growth and prop up its stock prices in the most recent decade by merging with other companies. When R&D fails, drug mergers abound. The CEO at Pfizer, the largest drug company in the world, has been discharged and replaced because in nine years he couldn’t figure out how to replace lost revenues from the patent expiration of Lipitor, the world’s best selling drug. A new play for Big Pharma is something called biologic drugs, which are large, complex molecules grown in living cells rather than synthesized chemically like small molecules. An example is Enbrel (etanercept), an injectable anti-inflammatory drug. But even patents for biologics are expiring. Yet another avenue for Big Pharma is the implantation of stem cells. But adoption of stem cell technology is lagging behind the drug patent expirations. Faced with no other alternatives, recently there has been greater global interest expressed for non-synthetic, natural medicines derived from plant sources due to better tolerance and minimum adverse drug reactions as compared to synthetic medicines. A closely held secret is that the idea for most drugs comes from nature. Natural molecules, often available as dietary supplements, exhibit the same biological action as Rx drugs. The trick now is how convert botanical drugs into prescription-only drugs as they are classified in countries like Germany, Italy and France. The US FDA appears to be covertly acting to declare all dietary supplements drugs under the presumption they are unsafe. This is a power grab that will surely threaten to destroy the $25 billion supplement industry which doesn’t have the political clout of Big Pharma (worldwide sales of $880 billion annual sales of prescription drugs). Big Pharma now has its own billion-dollar blockbuster pill provided by nature. It is GlaxSmithKline’s Lovaza fish oil concentrate, an $8/day prescription-only pill that lowers triglycerides, an undesirable blood fat (but raises LDL cholesterol, in case they didn’t tell you). Imagine the harvest of profits that awaits Big Pharma as it converts more natural molecules into blockbuster Rx drugs. The advantage Big Pharma has here is that insurance will often pay for these Rx-only drugs. Can nature trump modern pharmacology? A common scam conducted by pharmaceutical companies is to identify natural molecules in plants that exhibit novel biological activity and then rush to attempt to develop man-made look-alikes called analogs that become patentable drugs, when the natural molecule was as effective or even superior to the synthetic drug. Such is the case for resveratrol, a red wine molecule, now sold as a dietary supplement. Despite a flurry of research, resveratrol substitutes have not yet materialized. A major pharmaceutical company is no longer conducting research and development of the only resveratrol-based drug on the market, in what appears to be removal of an important paradigm-shifting technology from the marketplace. After all, resveratrol exhibits such broad biological activity it would virtually replace many drugs. This would be an unwelcome development for Big Pharma. While furious research is underway to develop resveratrol-like drugs, these efforts appear to be trumped by the combination of small natural molecules which work synergistically at relatively low dose to exhibit greater biological activity. However, the combination of resveratrol in a matrix with other small molecules derived from botanical sources has already been shown to far exceed the biological activity of plain resveratrol. The synthetic resveratrol drugs are going to have a tough time beating nature. Furthermore, such a combination resveratrol-based pill has been shown, unlike plain resveratrol, to exhibit no toxicity even at high dose. That would be difficult for any synthetic molecule to accomplish. Just how long the medical care establishment can hide resveratrol in the closet is unknown. One of the problems now facing Big Pharma is the large library of small natural molecules that exhibit broad biological activity and address “multiple therapeutic areas” (translation: many diseases) in one pill. If resveratrol doesn’t become a billion-dollar blockbuster, there are many other candidates that nature has lined up right behind it, like caffeic acid (coffee bean), curcumin (turmeric spice), quercetin (red apple peel), to name a few. The now antiquated idea of one molecule to treat one disease could be replaced by a single molecule or combination of natural molecules that address many diseases. It’s possible an 80-year old will soon be taking a single resveratrol-based pill to control blood sugar, prevent progression of arterial plaque and sudden mortal heart attacks, ward off cancer, and retain optimal vision. The opportunity for cost-cutting is obvious. Again, this dooms Big Pharma if the natural medicines can gain public adoption and exert sufficient political clout to remain on the market as supplements, not drugs. A royal battle could take place if the public is alerted to this possibility. A problem is that Big Pharma controls evening television news in America via advertising dollars. The battleground for dietary supplement freedom would appear to be on the internet. #### © 2011 Bill Sardi, Knowledge of Health, Inc. Not for posting on other websites.